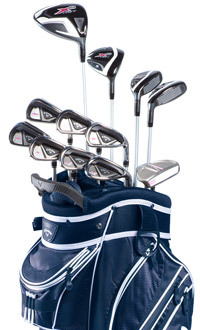 Includes Golf Digest 2014's Gold Medal Hotlist "Driver", "Fairway Wood", and "Game Improvement" award-winners. The X2 Hot Fairway Woods and Irons are a total technological marvel with more distance, consistent launch & versatility. The White Hot Pro Lady line was designed for women to drain more putts, with heavier heads that enhance feel and control, and a brushed steel finish that creates a great look at set up.